which is also my favourite season... and why you ask? and it's also the month we got married! Hence this is the reason why for my September 2017 Spotlight creation, I used 'Best Bun'!!! For this card I used Lawn Fawn pint sized patterns called beachside and let's bokeh in the snow (because when we got married, our theme colours for our wedding were all shades of BLUE! 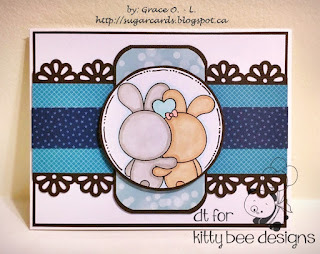 ), Michael's Craft's 110lb cardstocks, my copic markers and a little wink of stella for the bunny heart and bow! I hope you have a Happy Autumn!